I said it in my last post and I’ll say it again, I think Ina Garten is the Beyoncé of the food world. And this roast chicken is why I believe that. And after you try it out, you will too. 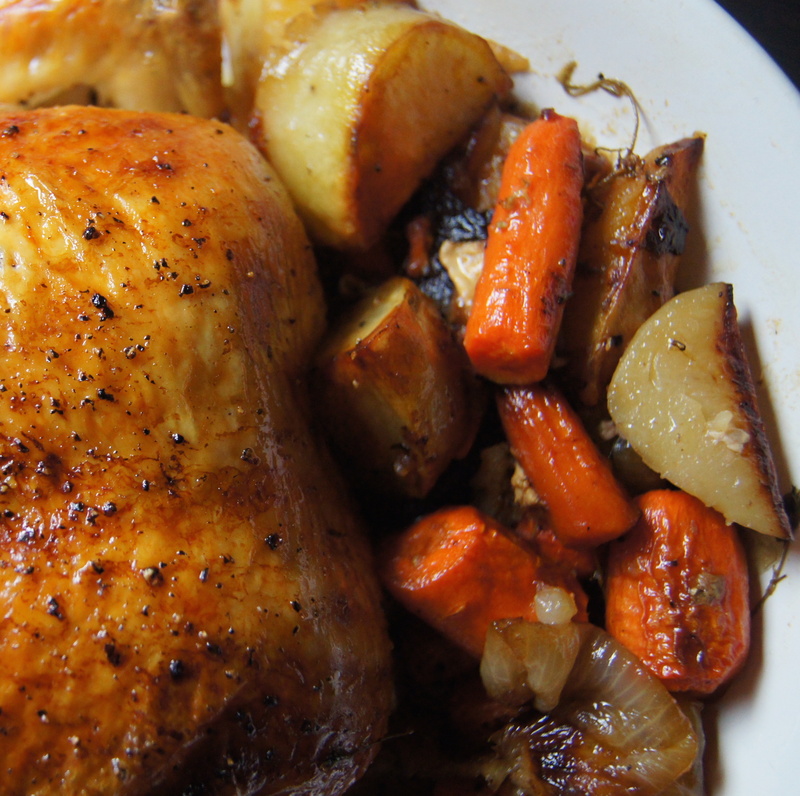 Ina’s roast chicken perfectly slays. 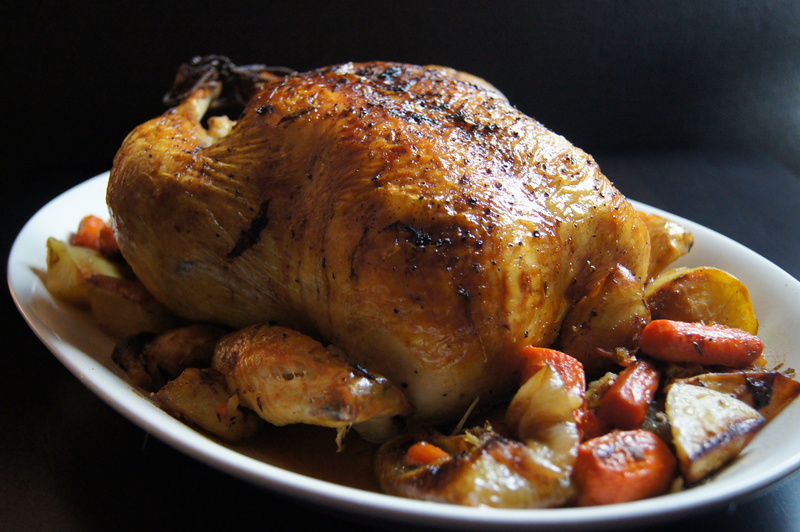 How do you take something as simple as a roast chicken and make it unbelievably delicious that it makes your heart melt? This is how. 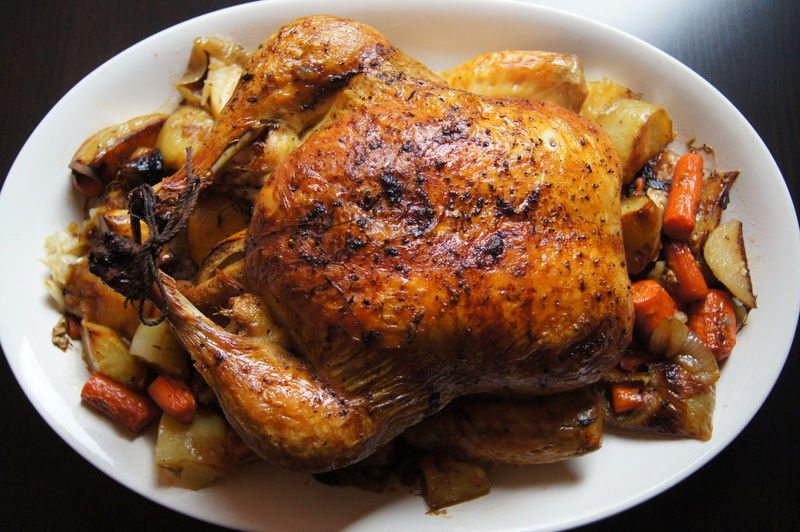 It is so incredibly easy to make, yet when the chicken finishes roasting and you taste how delicious and flavorful it is that you wonder if you blacked out and added a few extra steps to add to the flavorful. You didn’t. 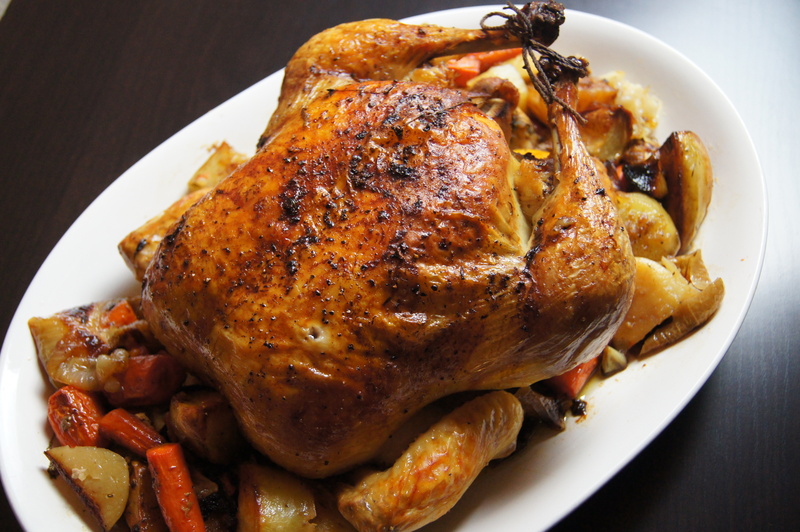 The ingredients and technique make this roast chicken phenomenal. What’s key to getting the skin nice and crispy is after removing the chicken from your refrigerator to let the it rest on your counter for at least half an hour. And most importantly to pat it dry with paper towels before you prepare it. And preparing is part of the fun. 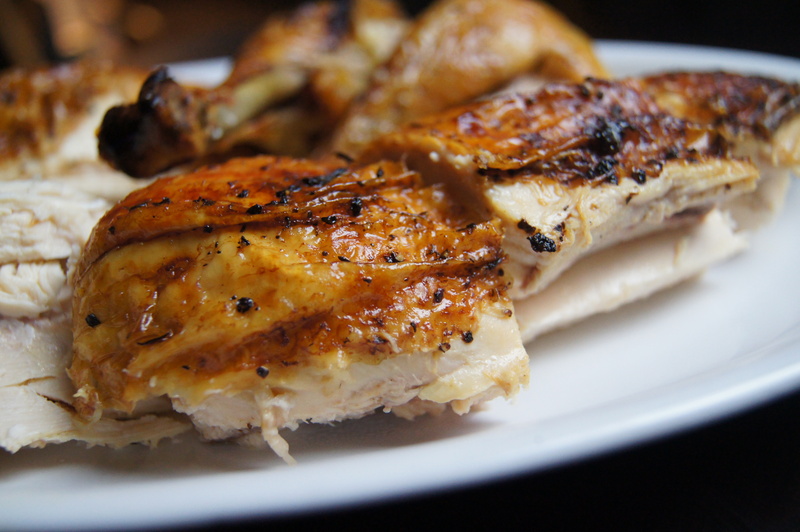 I say fun because this chicken will turn you into a total roast chicken geek. As the chicken is waiting on the counter, I prepare the lemon, garlic, and thyme to go into the cavity and place them on a plate. Every single time I look at the plate and think, “How is all this going to fit in the cavity?” It always does, especially with the help of Salt-N-Pepa in my head saying, “Push it. Push it real good.” And believe me you want all that goodness in the cavity because it adds to all the flavor. The other important reason to get all those great ingredients in the chicken is because it makes the chicken incredibly moist. I know, I know, you probably hate that word. But there are times when that word needs to be used. And this chicken is one of those times. You’ll find that there is no other word you can use to describe how juicy it is. OK, well, maybe juicy is a good substitute if moist is too much. For me though, when I hear juicy I think of two things: 1) Juicy Fruit gum and 2) Teresa Guidice’s husband, Juicy Joe. I used to be a big fan of store-bought rotisserie chicken. But honestly, after the first time I made Ina’s roast chicken I haven’t gone back. OK, I did once, but was left feeling a little lonely. I was missing my friend, Flavor – and the friend everyone loves to hate, Moistness. Don’t get me wrong, I think rotisserie chicken is super convenient and works well if you’re going to make something like chicken enchiladas or chicken salad. But if you’re going to have it on its own and the chicken will be the star of the show, this roast chicken is the way to go. With Thanksgiving coming up in a couple of weeks (for real? ), this is the same exact way that I prepare the turkey. The only differences being melting an entire stick of butter to cover brushing the entire turkey and including a quartered Spanish onion into the cavity. 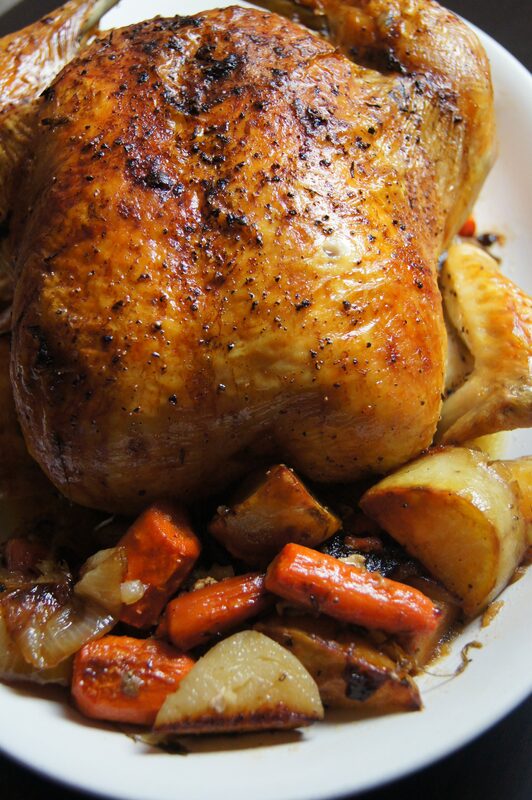 It only takes 2 and ½ hours to roast a 10-12 pound turkey. I know that may seems short, but trust me when I say that’s all the time you need. You will be guaranteed a tender and juicy (Juicy Joe!) turkey that you don’t need to drown in gravy because it’s dry. If I’m ever lucky enough to meet Ina Garten I will not only tell her how incredible her roast chicken is, but also how it always makes me an my family happy. Not only because it tastes so good, but because it’s been a big part of our Sunday dinners for so many years and will continue to be. The experience and memories are just as important as the flavor. I feel this way about so many of Ina’s recipes that I’ve made throughout the years and I’m excited to make more of her recipes. And these are the reasons why I believe Ina is the Beyoncé of food. Flawless. 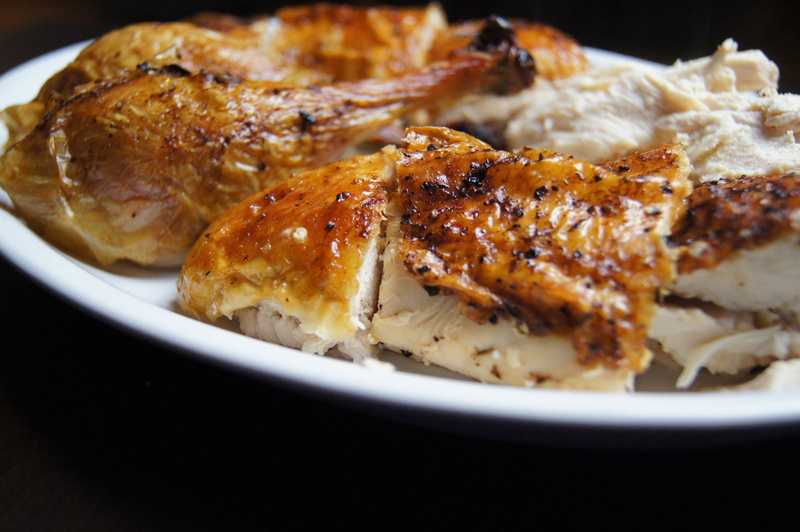 Let chicken rest at room temperature for at least half an hour. Remove the chicken giblets. Rinse the chicken inside and out. Remove any excess fat and leftover pin feathers and pat the outside dry. Liberally salt and pepper the inside of the chicken. Stuff the cavity with the bunch of thyme, both halves of lemon, and all the garlic. Place the onions, carrots, and potatoes in a roasting pan. Toss with salt, pepper, 20 sprigs of thyme, and olive oil. Spread around the bottom of the roasting pan and place the chicken on top. Let turkey rest at room temperature for at least 45 minutes. Take the giblets out of the turkey and wash the turkey inside and out. Remove any excess fat and leftover pinfeathers and pat the outside dry. Place the turkey in a large roasting pan. Liberally salt and pepper the inside of the turkey cavity. Stuff the cavity with the bunch of thyme, halved lemon, quartered onion, and the garlic. Brush the outside of the turkey with the melted butter and sprinkle with salt and pepper. Tie the legs together with string and tuck the wing tips under the body of the turkey.